We all know very well that the tech giant Google took advantage of its space at the Game Developers Conference to announce its brand new gaming platform. The service was born from Project Stream, which is a kind of Netflix for gaming and now delivers heavy titles on the Chrome browser on a notebook, PC or the app on a smartphone, tablet and even Chromecast on TV as well. The tech giant Google took advantage of its space at the Game Developers Conference to announce its brand new gaming platform, of course, known as Stadia. The service was born from Project Stream, which is a kind of Netflix for gaming and now delivers heavy titles on the Chrome browser on a notebook, PC or the app on a smartphone, tablet and even Chromecast on TV as well. As the tech giant Google’s CEO, Sundar Pichai said that “This is a platform for everyone,” while presenting the all-new gaming platform, Stadia. The product is exactly what Project Stream was, which led Assassin’s Creed Odyssey to run directly on Chrome. No need for specific hardware in the computer, but, you need a generous connection to decrease the time between the touch on the keyboard and response of the character. Basically, this all-new gaming platform of the tech giant Google, of course, Stadia can run in the browser of notebooks or PCs, and not only even we can run it on smartphones, tablets, Chromebooks and even in a TV as well that has Chromecast plugged. Moreover, we can start gaming on a specific Stadia website, or from a link within a game trailer on YouTube, the Play Store, a social media publication or even a web address that comes via email. The service will recognize a multitude of controls, keyboards, and mouse, but it has a specific control known as the Stadia Controller, which simply looks very similar to the Nintendo Controller Pro, but with the addition of a button to start sharing the game on YouTube. During the presentation, the Wizard button was used to open a video above the game, to understand how to get past a complicated point in Tomb Raider. The differential of this control that the tech giant Google has created is that it works directly connected to the Wi-Fi network, with commands that go to the game on the server and this will certainly decrease the latency, of course, it is the time between pressing the button and the character responds on the screen. 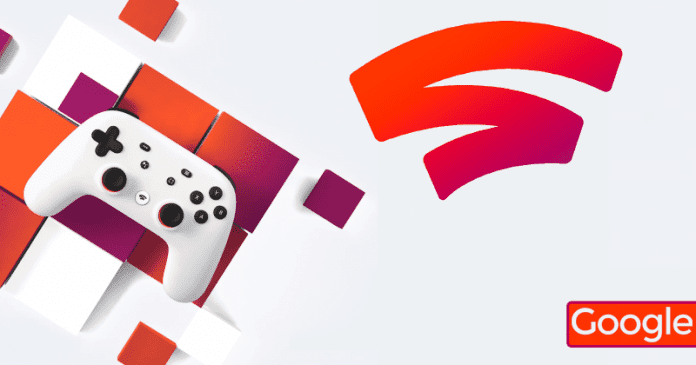 As there are several servers around the world, Stadia promises to deliver 1080p games at 60fps at this testing time. Wile at the launch it will work with 4K, HDR, 60 fps and in the future, it will go up to 8K with 120 frames per second. On the server side, AMD is responsible for delivering hardware that the tech giant Google claims to be more powerful than the hardware present on PS4 Pro and Xbox One X. In numbers, the Sony console scored 4.2 teraflops, versus 6 teraflops in the Xbox One X, while Stadia’s hardware (inside the server) made 10 teraflops. However, one of the most curious features of the Stadia is that the platform will allow the streamers who is playing and broadcasting via YouTube, open space of the game to play with selected viewers. And not only that even you can send a link to a person who loads a specific point of the game and the game will continue from that point only and back to Chrome. Currently, the tech giant Google hasn’t unveiled any specific launch date for its well-known gaming platform, of course, Stadia. But, sometime this year the tech giant Google could launch its new gaming Platform in Canada, the United States, the United Kingdom and some countries in Europe as well. Apart from its launch date, the tech giant Google also doesn’t unveiled any price information and not even the minimum connection to ensure the game’s fluidity. Even at an early stage, the tech giant Google says that more than 100 creative studios already have the development kit to bring their games to the well-known gaming platform, of course, Stadia.